Explore 50 hands-on science activities and interactive demonstrations at Future Innovators Night, March 8, at the Tucson Convention Center Exhibit Halls. 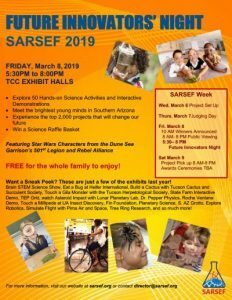 The free, family-friendly event runs from 5:30-8 p.m. It’s hosted by the Southern Arizona Research, Science and Engineering Foundation (SARSEF). 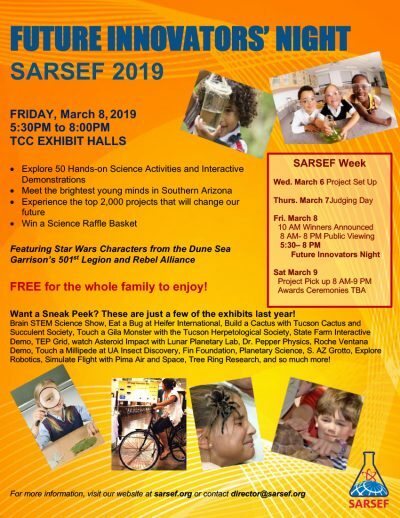 Meet the brightest young minds in Southern Arizona, experience the top 2,000 projects that will change our future, and enter to win a science raffle basket.